During his visit to Berbice yesterday for a ‘Meet the Public Day’ in Corentyne, Prime Minister Moses Nagamootoo, announced that he was donating $250,000 to the expansion of the Whim burial ground after being informed of its current state. 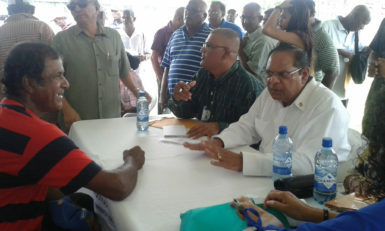 According to Regional Executive Officer (REO) Veerasammy Ramayya, the burial ground has become “small” since many persons are entombing their loved ones who have passed on. The REO said he then decided to donate a piece of land, in an effort to expand the burial ground and excavation work has been done on the land. The size of the burial ground is now approximately 3 acres. He said further that with the Prime Minister’s donation work will continue on the burial ground this week. According to Ramayya, the complete expansion of the burial ground will cost approximately $4 million. On behalf of the Whim residents he expressed his gratitude for the PM’s donation.